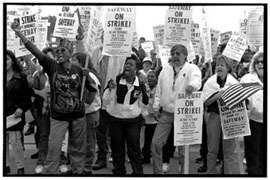 Safeway grocery store workers strike in California, 1995. Management and union leaders meet periodically to negotiate a labor contract. This contract details the obligations a company has towards its workers, such as the wages and benefits workers will receive as well as the conditions under which they will work. The contract also spells out the obligations a worker has toward his or her employer, such as coming to work on time and working in a productive manner. Contracts are good for a specified number of years. When that contract expires, a new one must be negotiated. If labor and management cannot agree on the terms of a contract, union leaders may call for a strike vote. Labor laws govern when a union can call a strike. Once a strike begins, production stops until the sides agree to a new contract.